It’s been almost one year since Dylan Redwine was reported missing. One year of his mother’s struggle to find answers. One year of investigations, searching and unanswered questions. And while his family is no closer to the truth, they have made a place to find peace. 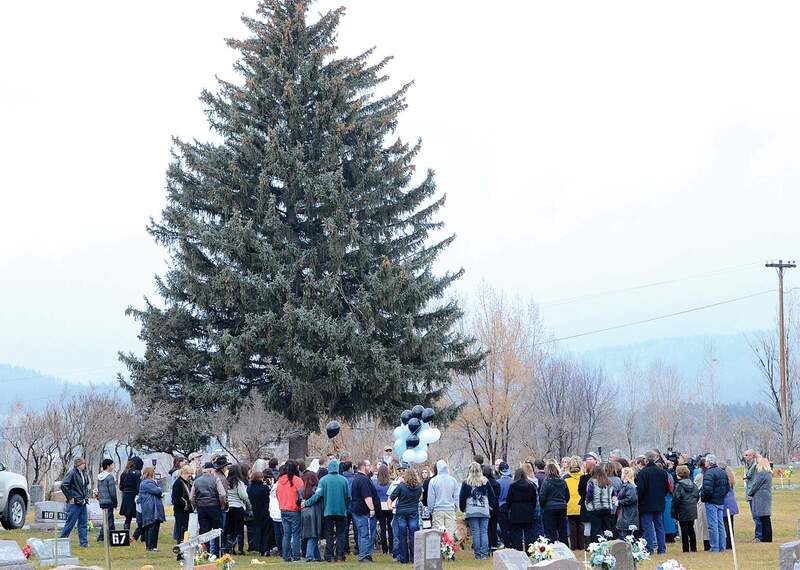 More than 260 people gathered Saturday at Pine Valley Foursquare Church in Bayfield for a memorial service to honor Dylan, followed by a dedication and blessing of a memorial bench at the Pine River Cemetery. In a heartfelt service led by Pastor Justin Gingerich, friends and family spoke, while television crews and other media quietly stood by. Friend of the family Bethany Wanket played a soft, simple “Amazing Grace” on violin, almost a slow fiddle that seemed to fit the occasion and the community. She said she also struggled with hope. Her words were met with more tears – her own and those of many others in the sanctuary. A larger-than-life portrait of Dylan, in his baseball uniform and ready to swing, stood near the podium. His team jersey, No. 19, was encased in glass underneath a mounted baseball from his school team. Some of Dylan’s closest friends shared their favorite memories of him. Fernando Stubbs spoke of his humor, saying how much he misses his friend. Dylan’s older brother, Cory, spoke lovingly of his only sibling, saying that Dylan’s birth changed his life. A close friend of the family, Denise Hess, said at times she wasn’t sure if she could continue with the immense undertaking of the search. Thousands of volunteers from near and far dedicated their time and resources to helping find Dylan, moved by a gentleness reflected in a picture of a young boy. What began as a local search effort on Nov. 19, 2012, grew to attract state and national attention and support. Initially there was hope of finding the missing boy. But those hopes were dashed when searchers recovered remains near Middle Mountain Road, north of Vallecito, 10 miles from where Dylan was last seen by his father, Mark Redwine, during a court-ordered visitation. The remains, found June 27, were identified as Dylan’s, but many questions remain unanswered. What is known is that he sent some text messages to friends in Bayfield from his father’s home, north of Vallecito, making plans to do what kids do, and the next day, he was gone. “It’s still an open and active investigation,” said La Plata County Sheriff’s Department spokesman Dan Bender. Bender, who has been involved with the case since day one, said evidence is now being reviewed in partnership with state and federal authorities. Bender said examination of the search area is on hold for the winter, but for now they will focus on evidence they do have. Mark Redwine could not be reached for comment. 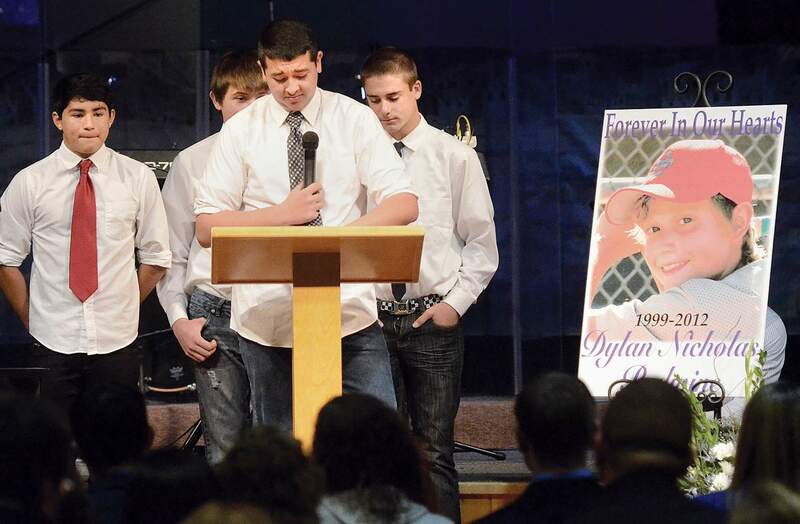 For now, Dylan’s mother, brother, friends and family have a place to remember him. The bench, in lieu of a tombstone, reads: “Our home run in life and now our angel in the outfield.” Underneath, it is lined with handwritten messages written on stones by those close to him. Dylan’s brother said since losing his brother, his heart has only grown. Hatfield said she knows her son is watching out for her. Fernando Stubbs, 15, front, and other close friends of Dylan Redwine share stories about him Saturday morning at Pine Valley Foursquare Church in Bayfield. In back from left are Ryan Nava, 14, Wesley Herring, 15, and Christopher Kane, 15. 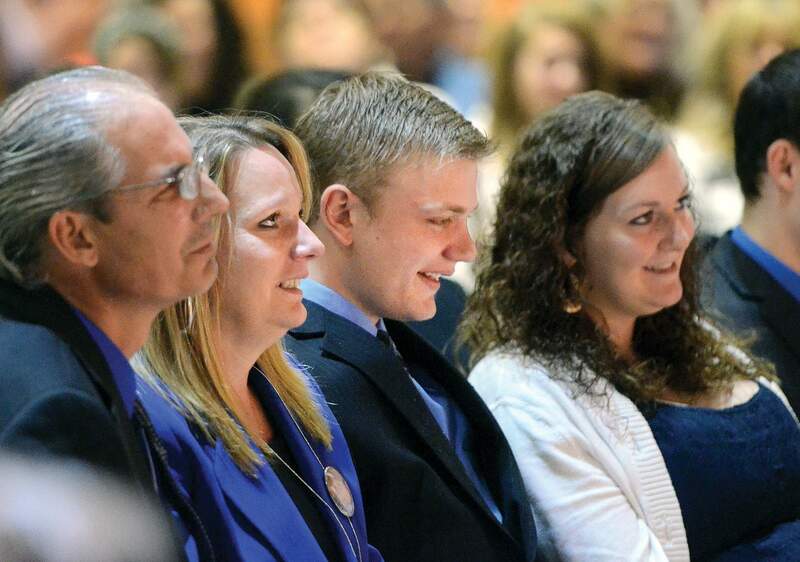 From left: Mike Hall; Dylan Redwine’s mother, Elaine Hatfield; brother, Cory Redwine; and Krystal Guilliams attended a memorial service for Dylan on Saturday morning at Pine Valley Foursquare Church in Bayfield. Friends and family of Dylan Redwine attended a memorial service on Saturday morning at Pine Valley Foursquare Church in Bayfield. The memorial was followed by the dedication of a stone bench at Dylan’s gravesite in Pine River Cemetery.